As a new feature here, I will highlight the top plays from two of the most highly rated tout sheets – The Gold Sheet and Power Sweep – breaking down the plays for you, and whether or not I agree with their selections. 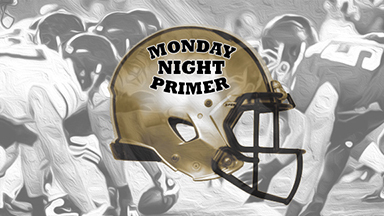 Mid-week you can expect to see the top college releases, and on Fridays, I will do the same with NFL selections. CENTRAL MICHIGAN +6′ vs. Syracuse – Citing the Chippewas’ stellar power rushing game, TGS likes Central Michigan to get it done as the home pup against the Orange. As TGS points out, the ‘Cuse were outgained by Villanova in overtime, something we’re not used to saying until the college basketball season. I can see their point with this pick, especially since MAC-member Northern Illinois just knocked off Northwestern, and emotions are running high in the conference, but I’m not going to give it a stamp approval. After all, the Chippewas have failed to cover five of their last six non-conference plays and are mired in a 2-10 slide in September. I also notice that Syracuse has covered 14 of 16 against this conference. Here’s a thought for teaser lovers, the ‘Cuse down to a pick might make more sense. ARKANSAS STATE +16′ at Miami-Florida – To the southeast we go, for a battle between an energized ‘Canes team that just found out it prominent university president is retiring and a Sun Belt beast that just played the SEC’s Tennessee very close last week. I can see this one taking place, as TGS points out Miami freshman quarterback Brad Kaaya is still making mistakes, having thrown two interceptions in each of Miami’s first two games. According to my sources in Miami, the ‘Canes should cover here because they can wear the Red Wolves down. And not only should Kaaya mature in this game, but Duke Johnson will finally show up. Apparently Miami head coach Al Golden speaks about Arkansas State as if it’s Notre Dame, leaving his players with the impression this is a must-win situation. You can argue the Red Wolves look like a decent play as they’ve covered five straight on the road dating back to last season, but they’re also a dismal 1-5 versus the books in September. Meanwhile, Miami is on a 5-2 spread streak in September games. RUTGERS +3, 53 over Penn State – These two haven’t met since 1995, but the rivalry is renewed now that Rutgers is in the Big Ten, and makes its debut with this game. TGS notes how well quarterback Gary Nova has progressed for the Scarlet Knights. Nova, along with Penn State QB Christian Hackenberg has been the conference’s two best quarterbacks after the first two weeks of the season. Both undefeated, this makes for an enticing conference-opener. This honestly could come down to which team is holding the ball last, and I’m not so sure the side in this one is as safe as the total, which I like to go over the posted number. After all, Nova leads the Big Ten and ranks third nationally with a 208.9 passing efficiency percentage. The senior has thrown for 563 yards, six touchdowns and has misfired with just one interception. Meanwhile, Hackenberg sits atop the league with 386.5 passing yards per game, which ranks fourth nationally, and has completed 54 of his 83 passes while throwing four touchdowns and four picks. These two will put on a show, and I like the final to soar. NEBRASKA -10′ at Fresno State – No surprise, really, as the Mountain West Conference’s favorite to win the West Division has been abysmal after the first two weeks of the season. In their season-opener the Bulldogs were trampled by Southern Cal, 52-13, and last week in Utah they were pounded by the Utes, 59-27. The scoring defense is what TGS points to in this one, given the Dawgs have allowed 56 points per game after two. Sure, this is Fresno’s home-opener, but I also have to question where this team’s defense has been, when the Mountain West Media Days I attended in July was all about the Year of the Defense. And make note, the league’s preseason Defensive Player of the Year was Fresno’s Derron Smith. The Cornhuskers will be much more focused in this one, after last week’s scare against McNeese State. If Nebraska blows out McNeese, I could see laying off this one. But the fact the Huskers got their early-season upset scare out of the way, they should be able to come in and victimize Fresno, which has failed to cover six of its last seven against non-conference foes. IDAHO -3 vs. Western Michigan – An improved Vandals team and travel is the reason PS likes Idaho to cover the field-goal spread in this game. Western Michigan has only played one game – a 43-34 loss at Purdue – and comes in after a bye week. That right there raises a red flag, as I don’t like to see teams taking Week 2 off. You spend the summer getting prepared for the season, get your campaign underway, play respectably against a Big Ten school and then cool off with a bye week? This could spell trouble when heading across the Mississippi – the first time traveling this far since 2008, when the Broncos visited Idaho last – another thing pointed out in PS. Looking back a bit, Western Michigan arrives on ATS slides of 6-14 against non-conference foes, 1-4 in the month of September and 2-8 overall. Idaho, meanwhile, has covered five of six against the MAC, but also has several betting numbers working against it, including being 7-19 ATS at home and overall. I’ll pass on this one. MARYLAND -3′ vs. West Virginia – Renewal of a strong rivalry that has generally been dominated by the Mountaineers. But according to PS, it’s taking the Terps because it can’t forget how bad Maryland put a whooping on West Virginia last season in a heavy rain. PS also notes the Terps having the better defense, and thinks they should pull away for a double-digit win given this one is at home. The home team has won seven of the last 10 meetings, while the road team has covered five of the last eight. I’m not fond of the half-point hanging on the field-goal line, and would much rather lay 2′ or 3, but do think Maryland is the team to play if you invest on this game. Though West Virginia hung with Alabama in the opener, it might be a little too overconfident after a blowout win against Towson last week. This week it goes up against the 25th-ranked defense in the nation and won’t be moving the ball as well as it did last week. CENTRAL MICHIGAN +6′ vs. Syracuse – Just as TGS did, I see PS is doing the same in this showdown at Kelly/Shorts Stadium in Mount Pleasant, Michigan. PS notes how Syracuse quarterback Terrel Hunt lost his cool last week against Villanova, and was ejected after throwing a punch in the game. Prior to that, he completed 10-of-17 passes for 94 yards. Make note that Hunt is a dual-threat QB for the Orange, and has plenty of experience after completing 61.2 percent of his passes for 1,638 yards and 10 touchdowns against eight interceptions in leading the Cuse to a 7-6 finish in 2013. Again, I’m passing on either side of this one, but would strongly consider teasing the Orange in this one. ARMY +28 at Stanford – PS says this could be a letdown for Stanford, while the Black Knights have the capability of shortening things and keeping things closer than four TDs. The Cardinal took a major hit last week against Southern Cal, in a tight, 13-10 setback. Whether or not Stanford will be 100 percent focused on this game, though it is in on a 15-6 ATS run in September and has covered four of five after failing to cash the previous week. Meanwhile, Army has failed to cover 17 of its last 25 and is mired in a 5-16 ATS slide on the road. I’m not so sure I’m ready to play a big underdog in this game, even as big as this number as is, since the Cardinal may be looking to avenge last week’s loss. TCU -13′ vs. Minnesota – Minnesota checks into Fort Worth on a slew of betting streaks, including a 6-1 ATS run on a natural surface, 5-1 against winning teams and also on the road, 8-3 when facing non-Big Ten teams and 7-2 overall. On the flipside, the Horned Frogs come in with jumbled betting streaks, having covered nine consecutive games after a bye week, but also mired in a 3-9 ATS slide at home. PS sweep notes the Gophers’ second-half collapse in last week’s 35-24 win over Middle Tennessee State, and the fact this is a ‘bye’ sandwich for the Frogs, who had last week off, and will enjoy another off week next weekend. TEXAS ST +10 vs. Navy – This is PS’s vaunted Dog of the Week, noting that Texas State is in after a 65-0 win over Arkansas Pine Bluff in the season-opener, and a bye week last Saturday, giving the Bobcats extra time to prepare for the Middies. Meanwhile, Navy will play with a suitcase in hand for the third straight week. PS says this is the Middies’ biggest road favorite role in seven years and might be a trap. I might have to agree here, as the Bobcats – albeit after just one game – has the seventh-best defense overall, behind the likes of Florida, Baylor, TCU, Pittsburgh, Indiana and Stanford. To its credit, Navy has covered five of six overall dating back to last season, but the Bobcats are also in on ATS win streaks of 4-0 against non-conference foes and 4-1 in September. I can see this one, and don’t mind a small play on the Bobcats. While three of Indianapolis’ wins this season were against teams considered less-than impressive (saving room for an opinion on the Dolphins), it’s two wins in the last three weeks that have everyone noting there’s nothing fluky – er, Lucky – about the Colts. On the contrary, behind quarterback Andrew Luck, these Colts were anything but fortuitous in a dominating 27-7 win at San Francisco on Sept. 22, and in a 34-28 home shootout victory over the Seahawks. The second-year quarterback threw a pair of touchdown passes and guided the Colts on two time-consuming scoring drives in the fourth quarter, taking the lead on Donald Brown’s 3-yard TD run with 8:55 to play, last week against Seattle. It was his ninth winning drive in the fourth quarter or overtime, the most through the first 21 games by any quarterback that began his career dating back to 1970. Now, in the Colts and Bolts’ first meeting since Peyton Manning was yelling “Omaha” for Indy, Luck is looking to run his string of good fortune to 3-0 with a suitcase in hand. Meanwhile, the Chargers are in after committing five turnovers in a loss at Oakland including three interceptions by Philip Rivers, who has two straight 400-yard passing games and three in four games. Though he looked awfully different than the quarterback who threw for 401 yards and three touchdowns to beat the Dallas Cowboys a couple weeks back, believe it or not, he could become the first quarterback in NFL history to have three straight 400-yard passing games. He can’t get too cocky, though, as the Colts’ stingy pass defense has intercepted seven passes in five games. As a matter of fact, the Colts are tied for fourth in the league with a plus-6 turnover differential. There are several angles to look at with these two teams, as it could go from being a defensive struggle to an offensive shootout very quickly. It could come down to the end and take a stroke of ‘Luck’ or ‘Bolt’ of lightning, you just never know. Honestly, as impressive as the Colts were in their win over Seattle, it was a physical game in which – let’s face it – Indianapolis did after rally from after a horrendous start that included a blocked punt to give the Seahawks an early 12-0 lead. Now the Colts are making their third long road trip in four weeks. True, they won the first two roadies at San Francisco and Jacksonville by a combined score of 64-10, and they can take solace in knowing the Chargers have allowed some glaring numbers on defense (432 yards per game). Then again, San Diego’s two wins came against highly explosive Philadelphia and the same Dallas team that almost knocked off Denver. The Chargers will need to play exquisite on defense, if Luck plays his best game – something he’s been doing. The 6-foot-4, 240-pound quarterback is emerging quickly as the best young quarterback in the game, as he calls the signals and leads an offense as it’s supposed to be done. His fundamentals are near-flawless, and what has really matured him and separated him from the pack of others who broke out with him last year is his patience. The biggest question about him, and we’ll all have to wait for the answer, is how will he do in his Monday night debut? While Luck has spearheaded the Colts’ offense this season, it was the rushing game that was ranked 4th in the league overall to start Week 6; the passing game ranked 24th. Indy’s pass defense has been stellar, as it came into the weekend 6th in the NFL. The rushing D has been less-than impressive, as it was 30th. The Colts arrive in Southern California on ATS win streaks of 8-0 against losing teams, 6-3 on the highway, 8-1 on Monday Night Football, 4-1 in October and 12-5 dating back to last season. Indianapolis has stayed under in 23 of its last 31 games dating back. The Chargers came into Week 6 with the fifth-ranked offense overall, led by the fifth-best passing game. However, their defense has been lacking and entered the weekend ranked 27th overall. San Diego has been beaten by both facets, ranking 24th against the run and 27th against the pass. The Bolts are tied for 28th at minus-8 in turnover differential. San Diego checks into primetime on ATS runs of 5-0 after a straight-up loss and 4-1 overall. Conversely, the Bolts are mired in spread slides of 6-11 at home and 0-6 in the month of October. In this series, however, the Chargers have covered 6 of 7 and the underdog is on a sterling 8-0 ATS run at the window. The under has cashed 5 of the last 6 meetings. INJURY REPORT: COLTS: DNP (Did Not Practice): S LaRon Landry (ankle), LB Bjoern Werner (foot). LIMITED: LB Erik Walden (elbow). FULL: RB Stanley Havili (ankle), DT Ricky Jean Francois (groin). CHARGERS: DNP: LB Donald Butler (groin), LB Jarret Johnson (hamstring), CB Richard Marshall (groin), G Chad Rinehart (toe). LIMITED: T D.J. Fluker (calf). FULL: RB Ryan Mathews (concussion), CB Johnny Patrick (chest). ON DECK: The Chargers will make their third trip across the country, while Indianapolis and Luck will play arguably the franchise’s biggest game in history. San Diego is laying 7.5 at Jacksonville, while the Colts are catching 5.5 at home from Manning and the visiting Broncos. There is plenty of good action on the card this week, but for me, the spotlight game is in Indianapolis, where two of the most exciting rookie quarterbacks from last season meet when the undefeated Seattle Seahawks with Russell Wilson take on Andrew Luck and the Colts. Seattle (4-0) is laying -3 points to the Colts (3-1). Luck, who was selected by the Colts first overall in the 2012 NFL Draft, is 14-6 in his career, a record that matches John Elway for the best 20-game start by a quarterback drafted No. 1 overall. Today he puts his talent and his team’s undefeated mark up against Richard Sherman, arguably the best cornerback in the NFL. The Colts have won and covered six straight as a home underdog, and roll into this one on home winning streaks of 10-2 straight-up and 9-3 at the window. Seattle, meanwhile, is on a perfect 5-0 ATS streak with a suitcase in hand, and Wilson is a major reason for the success. The second-year pro, who was selected by the Seahawks with the 12th pick in the third round (75th overall), comes into this one after leading Seattle from two scores down in the fourth quarter in last week’s 23-20 overtime win in Houston. Seattle has won nine straight regular-season games and 11 of last 12, while the Colts are 8-2 at home since coach Chuck Pagano took over last season. New England (-1) at Cincinnati – The Patriots have won 13 of their last 14 games in the regular season, including six straight while ordering room service. … The Patriots have won their last four games against the Bengals and seven of the last eight. … Meanwhile, the Bengals have won five of their last six at home both SU and ATS. Detroit at Green Bay (-7′) – The Packers’ 21 straight regular-season wins at home against the Lions, including games played in Milwaukee, is the longest in NFL history. … Including a playoff win, the streak is actually 22. … The Packers have won nine straight at home against all NFC North opponents. … Green Bay is on winning runs of 6-1 SU and 7-0 ATS after bye week under coach Mike McCarthy. … The Lions are mired in an ATS road losing streak of 1-6 when catching points. New Orleans (-1′) at Chicago – The Saints remain one of two unbeaten NFC teams, along with Seattle. … The Saints last won at Soldier Field in 2000, and are 0-3 there under coach Sean Payton, including the 2006 NFC championship game. … The last 5 meetings at Soldier Field have gone over the posted total. Chicago is mired in an ugly 1-7 ATS slide at home. Denver (-9) at Dallas – The Broncos have won four straight and have covered 7 of 8 against the Cowboys. … The Broncos have won 15 straight regular-season games by seven or more points – the second-longest streak behind the 1941-42 Bears. Since running back DeMarco Murray – a graduate of Las Vegas powerhouse Bishop Gorman High School – became the primary running back for the Cowboys, they’re 11-0 when he carries the rock at least 18 times; they’re 1-10 when he doesn’t. … The Cowboys have the best record in interconference games since 1970, however, they’ve dropped three straight to the AFC West, including two this year to the Chiefs and Chargers. … The Broncos are on winning runs of 7-1 SU and 6-2 ATS as a road favorite and 8-1 against NFC East teams. Houston at San Francisco (-4′) – The home team has won the last two meetings, both by three points. … The Texans are the only NFL team with a top-five offense and defense. … The Texans are mired in a 1-5 ATS slide on the road. … The 49ers have lost 7 of 9 straight-up against teams out of the AFC South. Five teams remain undefeated heading into the final game of Week 4. After tonight there will only be four, as the Miami Dolphins (3-0) travel to the Big Easy to take on the New Orleans Saints (3-0). The Saints seem to be revitalized with Sean Payton back under the headphones, running the show. His troops opened the season with a 23-17 win over NFC South-rival Atlanta, then won an ugly divisional-showdown against Tampa Bay, 16-14. But after looking out of sync in Weeks 1 and 2, New Orleans’ prolific offense looked like its old self, as it racked up 423 yards in a 31-7 rout of Arizona, and quarterback Drew Brees passed for three touchdowns and ran for another. Tonight the Saints take a crack at Miami’s 22nd ranked defense that has increasingly allowed more points over the first three weeks. In wins at the Browns, at the Colts and versus the Falcons, the Dolphins allowed 10, 20 and 23 points. And while they’re a well-coached team, talented on both sides of the ball and are seemingly playing with plenty of motivation, there are many who don’t think they’re legitimate contenders. Even with wins over prolific quarterbacks Andrew Luck and Matt Ryan the last two weeks. Tannehill might have wins over Luck and Ryan, but he also leads the NFL in sacks with 14 and fumbles with five. Heading into this game, he’s on pace to challenge for the league records in both categories. That’s not necessarily a good thing against a largely improved Saints defense from last season. New defensive coordinator Rob Ryan has the Saints in a 180-degree turn from last season, when New Orleans allowed an NFL-record 7,042 yards (440.1 per game). This year the Saints rank fourth in the NFL, allowing 295.7 yards per game. Even further, the Saints have allowed offensive units a mere four touchdowns over the first three games. The Saints’ defense is specializing against the pass, which could spell trouble for Tannehill, as they rank fourth in the league with air control. I suspect we’re going to see Tannehill and wideout Mike Wallace hooking up – are trying to – as Wallace is a New Orleans-native. He has 12 catches for 152 yards and one touchdown this season. If Tannehill can perform, this could be an entertaining shootout. If the Saints get to him, it could be an easy win in the Big Easy. The Dolphins are seeking their first 4-0 start since 1995 in what will be the franchise’s NFL-high 79th appearance on Monday night. If it comes down to the end, don’t be surprised to see the Fins put their trust in rookie placekicker Caleb Sturgis, who is 6 for 6 on field goals, including 3 of 3 from between 40-49 yards, and 2 of 2 from 50 yards or longer. Tannehill has completed 66.4 percent of his passes for 827 yards, four touchdowns and two interceptions, resulting in his 94.3 QB rating – higher than Brees’ 91.4 rating. The Dolphins come in on ATS win streaks of 4-0 in September, 12-4 against winning teams, 22-10 with a suitcase in hand and 5-1 overall. Brees has completed 63.8 percent of his passes for 1,021 yards, six touchdowns and four interceptions. And when the all-Pro gunslinger is playing in the final game of the week, it’s an upgrade of sorts. Brees has won his last eight starts on Monday nights, completing 71.1 percent of his passes for 2,467 yards with 24 touchdowns versus five interceptions for a 120.6 rating in those games. Brees has 300 yards passing in eight straight games, the second-longest streak all-time. Look for Brees to target tight end Jimmy Graham, who has 19 catches for 313 yards and three touchdowns in his past two games, and wideout Marques Colston, who has nine touchdowns in his past eight games in Superdome. The Saints are in on ATS win streaks of 4-0 on Mondays, 18-5 in the Big Easy, 18-6 on the fake stuff, and 13-5 after a straight-up win, 10-4 against winning teams and 14-6 after cashing at the window. ON DECK: The Dolphins return home, while the Saints march on the road in Week 5.